In 1988, notorious cult filmmaker John Waters finally achieved mainstream recognition with Hairspray. His star and muse Divine a.k.a. Harris Glenn Milstead helped the filmmaker get there and deservedly basked in the praise. Sadly, he died the same year before realizing his dream of becoming a prolific character actor. 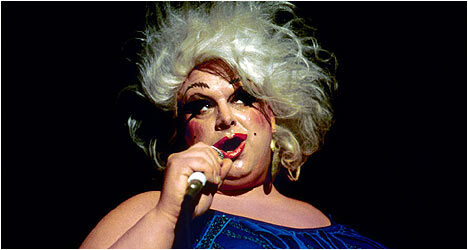 However, Divine became an LGBT icon and has been given a loving tribute in the documentary I Am Divine (2013). The film begins at the height of Divine’s popularity with the release of Hairspray and then takes us back to her humble origins as Harris Glenn Milstead, an overweight child in Baltimore, enduring physical and mental abuse at school. He found solace in a hairdressing job and became part of the gay underground scene. His life changed when he met and befriended John Waters. They bonded over a mutual love of Russ Meyer’s raunchy B-movies. Milstead, Waters and several of their friends experimented with LSD and other drugs and alcohol, which helped bring him out of his shell. He threw extravagant parties and paid for it with his parents’ credit cards (without telling them). With the help of close friend and mentor David Lochary, Milstead discovered drag and achieved his desire to look like Elizabeth Taylor. When he was 17, Waters got a movie camera and started making ultra-low budget movies with his friends, chief among them Milstead who Waters subsequently dubbed Divine. After a couple of movies, Divine became Waters’ leading lady with Mondo Trasho (1969) and then Multiple Maniacs (1970), which was significant in that it was their first film to have dialogue. They made movies that epitomized guerrilla filmmaking as they gleefully smashed every taboo they could think of. Waters and his friends took what would become the punk rock aesthetic and applied it to filmmaking. This culminated in Pink Flamingos (1972), which pushed the boundaries of bad taste to extreme limits and this resulted in Divine actually eating dog feces on camera. Milstead’s story is related via vintage archival interviews with him and more recent interviews with friends, family and admirers. For people who only know him from Waters’ movies, I Am Divine provides insight into his humble beginnings and later theater work in New York City. The film is a loving tribute to Divine and features all kinds of entertaining stories told by those that knew her. Milstead was a trailblazer and this documentary does an excellent job of chronicling his life and career. There is an audio commentary by director Jeffrey Schwarz, producer Lotti Phariss Knowles and actress Mink Stole. He talks about the genesis of the documentary, which came out of his obsession with John Waters’ movies. Schwarz and Knowles share anecdotes about making their film while Stole recounts stories about Divine and Waters on this engaging track. Also included is 30 minutes of deleted scenes that feature even more anecdotes and stories about Divine.